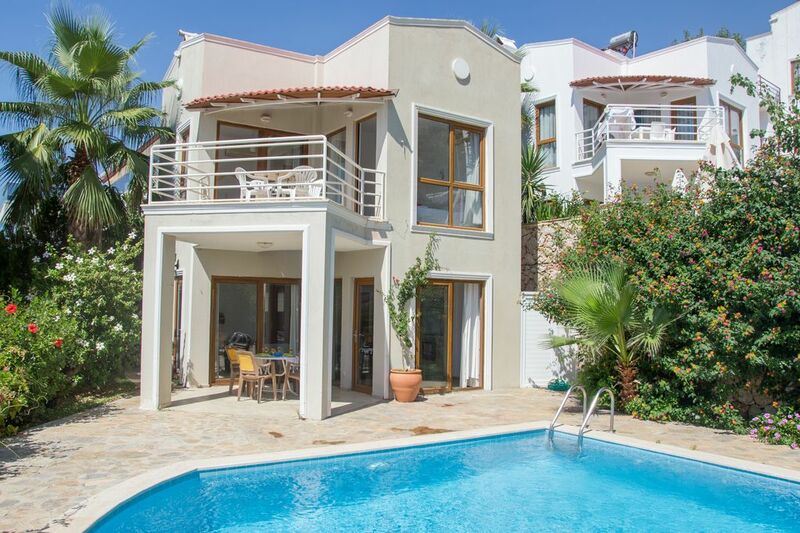 The villa is situated on a hill overlooking splendid views of Kalkan bay from every angle of the property. At ground level there is a pool surrounded by a large planted garden with sunny grassy areas as well as shady parts. The garden contains many colourful plants and has an olive tree overhanging the wall. The top floor of the villa is a roof terrace which also has splendid views of the sea and mountains. It can be used as a sleeping area by those who like to sleep under the stars. It is a 10 minute drive up into the mountains and a 5 minute drive down to the beach. A 15 minute walk down the hill takes you into 'sleepy' Kalkan village with many restaurants and shops. From the village it is a further 5 minute walk to Kalkan bay which has a pebble beach and offers excellent and safe swimming. 3 flights of stairs up from the villa is a small shop, restaurant and vegetable and fruit stall. The nearest sandy beach is Kaputas - used mainly by locals 10 minute drive away. I am a nutritionist working in the humanitarian aid sector and also a musician (Jazz saxophonist). I bought the property six years ago following an unplanned holiday in Kalkan. I had always wanted a property in the sun but France and Spain were outside of my price range. When I was shown the villa I fell in love with it and Kalkan itself. It brings a smile to my face everytime I think of it. The villa and location are pretty luxurious by my standards. I don't get over enough and tend to visit mainly out of season as it gets booked up. When I do go I feel relaxed and healthy within a day of being there. It is a great place to unwind but you can also be adventurous and discover beautiful towns and beaches in what is a massive country with a fascinating culture. I bought the property twelve years ago following an unplanned holiday in Kalkan. I had always wanted a property in the sun but France and Spain were outside of my price range. When I was shown the villa I fell in love with it and Kalkan itself. It brings a smile to my face everytime I think of it. The villa and location are pretty luxurious by my standards. One of the things I really love about the villa and its location is the juxtaposition of mountains and sea. Kalkan is surrounded by high mountains and the juxtaposition is most breath-taking at Kaputas - a local beach used mainly by locals. It is only a 20 minute car journey into the mountains which are snow capped from around November through to April. The coastline with its characteristic turquoise sea colour is so seductive. I don't get over enough and tend to visit mainly out of season as it gets booked up. When I do go I feel relaxed and healthy within a day of being there. It is a great place to unwind but you can also be adventurous and discover beautiful towns and beaches in what is a massive country with a fascinating culture. I invariably drive to a mountain village every time I am over there and stay a night. Kalkan itself offers all modern comforts, e.g. restaurants, good shops, banks, doctors, etc. However, you can also get away from it completely with a short drive. The villa being on a hill-side feels remote but it is only a five minute drive down the hill to Kalkan town. I have a busy life but the villa is a great antidote to all the stress that builds up. En-suite bathroom to bedroom 1 with shower, sink, bidet and WC. En-suite bathroom to bedroom 2 with shower, sink and WC. Separate WC with hand-basin and washing machine downstairs. L-shaped lounge/dining room. Dining room area has extendable table that seats 6 people and two doors that open onto garden/pool area. Lounge fireplace with mantle-piece and coffee table. Gas cooker, fridge/freezer, washing-machine, dishwasher, toaster, kitchen-bar, all kitchen utensils. Highchair for children can be provided with early request. There are also two outdoor dining areas; one by the pool on the ground floor, and one on the balcony on the second floor. Beautiful garden surrounding the pool. Many different colourful flowers and plants and two trees. Has an olive tree over-hanging one side of the garden. This adjoins both bedrooms on the first floor and has a small dining table and chairs. Large Roof terrace which has a wash basing and great views. Can eat up there or watch the lights on the sea at night. Snorkels and body board available. Approximately 6x3 meters and about 5 feet deep. Steps into the pool. Not overlooked. Notes on accommodation: There is air-conditioning in the two bedrooms and the lounge/dining room. There is also a large fan downstairs. There is a stone spiral stair-case to the bedrooms which continues up to the roof terrace. The property is suitable for children. Each bedroom has a door leading to a shared semi-circular balcony which has a dining table and chairs. There are a number of doors on the ground floor (four) which can all be opened. Three lead directly to the pool area. Outside: The large garden area boasts a colourful selection of plants and trees (including banana trees). Dimensions of the private pool are 12 by 20 feet and it is uniformly deep (about 5 ft). It is cleaned every morning (usually very early) and the garden is watered regularly. There are four sun-beds, two parasols, and an outside dining table with chairs in the pool/garden area. The verandah area is shaded. The pool is comfortably warm between June and September. There is a house barbecue which is either used on the roof terrace or in the garden. There is a circular balcony accessed from both bedrooms on the first floor. The balcony has a table and chairs. Utility Room: Separate WC downstairs also houses the washing-machine. Cleaning / Towels / Linen / Maid service: Towels and linen are included. Property will be cleaned before arrival and on departure. Guests can clean linen and towels in washing machine. Extra cleaning services can be arranged. Other: Terrace at top of villa reached by spiral stone stairs. Large area with stunning views. Has sink and barbecue and waist-high walling. Villa has two round tables that can be carried upstairs so that meals can be taken on the roof-terrace. Thanks for the lovely review Caroline. This was our second time in Kalkan, it really is a wonderful place. The villa is excellent, we love the freedom of our own place and definitely our own pool. However the villa has amazing views that you don’t tire of, but you are very high up. We walked into town which took approx 30 minutes, the roads are very steep and uneven. Flat shoes a must. We always got a taxi back which was always 15 tl, £2 at the moment. The villa is clean but does need a bit of TLC. On the whole a great stay. Stayed here for 10 nights Sept 18. Previously stayed here 4 years ago . Fabulous view, great private pool, spacious villa with everything you need. Great value for money . Steep walk into town but we always got taxis back for around £2. Fabulous restaurants in Kalkan, in 10 nights not one bad meal. Great villa with a lovely pool. It had everything we needed, most important being the pool and at least a bit of shade in the garden at any time of day! It is a steep walk down to the town and a bit further to the harbour and the sea, but you feel as though you've earned your dinner a little! We got taxis back some of the time but enjoyed the walk back too, knowing there was a pool waiting for us! There are loads of great places to eat in Kalkan but there is also a restaurant/cafe very close by which does excellent kebabs and pride (Turkish pizza). Next to that is a small shop that has all the essentials and there's also a greengrocer stall. Lovely views from the house over Kalkan, whether you're in the garden, first floor balcony or on the roof. There is a bit of breeze because you're higher up than the town but we used the aircon overnight. We felt very relaxed and safe for our whole stay and very welcome. I'd highly recommend Turkey. We had an amazing stay! Villa Tara is beautiful, it has amazing views and the pool is fantastic. Sharon and Remi are really great and stayed up until the early hours of the morning waiting for us to arrive, there was a very welcome welcome pack in the villa of bread, coffee, milk, sugar, butter and jam which was a warm and welcome sight after along journey, Sharon did a fab welcome talk the next morning and told us where to go, this was fab. We even started a Villa Tara Guest review book where guests could write down there experiences of Kalkan like the restaurants and activity's so everybody could read a variety of different reviews. The Villa was nice had plenty of cups, plates, pans etc so fab for when you just want to have a little BBQ, we had to buy beach towels though as there was only two small outside bath towels for three people so i would suggest packing a towel or two, we luckily took our laptop so we could watch a few films in the evening as there isnt any English tele , just one news channel, so we were glad we had internet and Netflix as the evening would of got a little boring , sorry to say but the beds need to have a topper on them it was like sleeping on bricks, we have lived abroad for 6 years and understand that it is hard to get a soft mattress but toppers you can get anywhere, we ended up sleeping on the sofa bed downstairs after trying the master bedroom and the spare room as the hardness of the beds started my sciatic off. But all in all it was just the right size for three people and yes i would book Villa Tara again..
We had a wonderful time at Kalkan the resort was superb. The villa was very clean with everything we required. There was a rep who met us on the first day and answered all our queries. We went at the end of June and it was extremely hot so the pool was well appreciated .I would definitely recommend this villa. The nearest beach is Kalkan bay which is 20 minutes walk and 5 minutes by car. It is a pebble beach, extremely clean rarely overcrowded and excellent for safe swimming. The nearest sandy beach is Kaputas which is a 5-10 minute drive away (about 5km). The beach is stunning and the swimming excellent. The celebrated Patara beach is a 15 minute drive and boasts over 20 km of sand. The 25 km drive to Kas has some of the most spectacular coastal views you are ever likely to see. Dalaman is the nearest airport. It is approximately a 1½ hour drive to the villa (now that the new road has been built). The next nearest airport is Antalya which is approximately 3 hours drive (either through the mountains or along the coast). Car hire is recommended but not essential as bus services are excellent. Car hire is reasonably priced. If too tired to walk up to the villa taxis can be used cheaply. The cheapest option is mopeds which can be hired in Kalkan. Kalkan village is approx ¾ mile away. The nearest coastal town is Kas - about 25km away. Fethiye is approx 1 hour drive. Mountain villages like Elmali and Goombe can be reached by car in approx 1¼ hour. There are many historical and geographical sites of interest within one hour of driving, e.g. Xanti (ancient ruins) and Saklikant (gorge). The lake region of Turkey can be reached in roughly 4 hours and Cappadocia is a two day journey with tours easily arranged in Kalkan town. Kalkan has many restaurants and shops (including several supermarkets). Restaurant food is excellent and relatively cheap. You can buy pretty much everything you need from shops and supermarkets accept pound sterling, Euros and dollars. There are three banks in Kalkan and a number of cash machines. Phone exchanges are incredibly cheap for long-distance calls. There are two doctors who are very accessible and experienced in typical holiday ailments. A weekly travelling market visits Kalkan on Thursday and is worth a visit. Bargaining is expected. Kalkan offers water-sports, paragliding, and midnight cruises. There are many agencies in town that will arrange excursions ranging from horse-riding on Patara beach to visiting the sunken city of Kekova. These are all very reasonably priced and include excellent meals as part of the excursion. For those suffering football withdrawal symptoms most important games an be seen in local bars. Although it is easy to spend two weeks in Kalkan and it's catchment area, a trip to the mountains to see authentic Turkish life is recommended. The mountain villages of Elmali and Goombe are not only beautiful and fascinating but they can also provide a way to escape the heat of summer for a few days. The drive through these mountain ranges is quite staggering. Oh yes, the cost of living plummets when you get up there. For the most adventurous a trip to Cappadocia to see ancient Byzantine dwelling in a volcanic valley where the call to prayer echoes five times a day is a once in a life-time experience. Baloon trips can also be organised once there. This journey takes 10 hours and is best spread over two days stopping off in the Lakes region over night. Here you can find cheap accomodation, enjoy mountain lake fresh-water swimming and enjoy great food (especially fish). Booking Notes: Bookings can be made online or by phone. A non-refundable deposit of 15% is required with final balance of payment received no later than 4 weeks before departure. Cancellations 2-4 weeks before departure will allow for a 50% refund. There is no refund for cancellations in the 14 days before departure. Changeover Day: There is no preferred changeover day and arrival and departure times can be negotiated. Notes on prices: Prices are for the property per week in UK pounds. The second, third and fourth weeks or any booking are discounted at 20%. Long winter lets of four weeks or over (November - March) are priced at £225 per week.